Where Does Steve Nash Rank All-Time? Eight NBA All-Star appearances. Two NBA MVP’s. 10,335 career assists – good for third all-time. Future Hall-of-Fame inductee. Steve Nash had an excellent NBA career. There’s no disputing that. His eight-year run in Phoenix was incredible – 16.3 points, 10.9 assists, 51% field goals, 43.7% 3-point field goals, 91.2% free throws, three trips to the Western Conference Finals. What he and Mike D’Antoni did was revolutionary. And let’s be honest, if it wasn’t for Robert Horry body-checking Nash into the scorer’s table that led to a bench clearing altercation, both he and D’Antoni would have at least one NBA championship under their belt. But there’s one thing I absolutely cannot stand in today’s world. Everybody lives in the moment. If a great play happens everyone has to automatically pose the question on whether or not it was the greatest we’ve ever seen. Or when a player wins a championship, or retires, in Nash’s instance, they begin to get severely overrated and the world seemingly forgets all the great players that came before. I look at Steve Nash sort of the same way I look at Drew Brees in the NFL. Both players were good but not great on their prior teams. Brees started becoming a nice quarterback in San Diego, even made a pro-bowl, then he went to go play with Sean Payton and his system in New Orleans and became one of the game’s best. Steve Nash in Dallas was a good, solid point guard. He wasn’t one of the first ten players in the league you’d consider to be the best. He likely wasn’t even top ten at his own position. 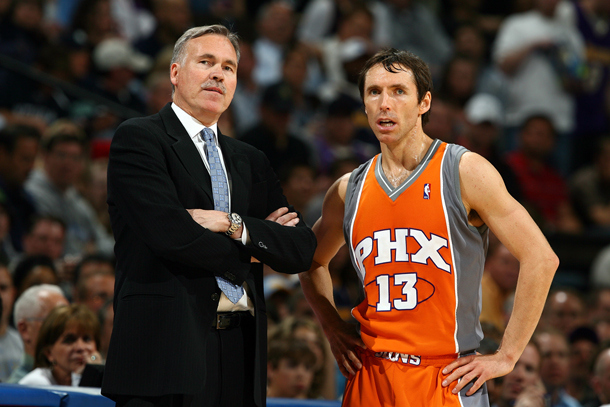 Then everything changed in Phoenix under D’Antoni and Nash became a two-time MVP. I understand both Nash and D’Antoni helped each other immensely during their marriage. Nash was the perfect fit for his system and D’Antoni was the perfect coach for Nash. I see two different levels of greatness in sports. There are players who are great because of the systems that they’re in and then there are players who are just great. Nash is the perfect example of being great due to the coach/system and a guy like Jason Kidd is a perfect example of a player just being great. Once Nash announced his retirement the love pouring for him on twitter was expected, and rightfully so. But then you just started seeing hilarity ensue. People started becoming delusional when talking about some of the all-time ranks. I am 100% unbiased. Hell, I barely care. But, in their primes, I take Steve Nash over Jason Kidd. Pretty easily. I don’t mean to single out Pearlman, who is an excellent follow on twitter, he wasn’t the only one that tweeted something outlandish, but this is pure insanity to me. Kidd completely dominated games, often times without even having to score. He was a triple-double machine that took a marginal New Jersey Nets team to back-to-back NBA Finals. Granted the Eastern Conference was weak, but reaching the championship two consecutive seasons is nothing to sneeze at. But on top of that, Kidd was also a premiere defender at his position. Something that should not be overlooked considering Nash’s severe weakness at that end of the floor. For my money, I have Nash at the bottom of the top-10 best point guards of all time. Which is no small accomplishment. There have been a lot of great players throughout the history of this game. Magic Johnson: 12-time NBA All-Star, 3-time NBA MVP, 5-time NBA Champion, 3-time NBA Finals MVP. Career averages of 19.5 points, 7.2 rebounds, 11.2 assists, 1.9 steals, 52% field goals, 10,141 career assists (5th all-time). Magic is likely the biggest lock on this list. Not the only one, of course, but easily the most versatile player in the history of the game. LeBron James before Lebron James. Magic made it cool for six-foot-eight guys to be able to handle the ball. If it wasn’t for being diagnosed with H.I.V. and missing at least four years of his career, Magic would be no worse than second all-time in assists and maybe even have another championship, who knows. John Stockton: 10-time NBA All-Star, 2nd team All-NBA defense 5 times, NBA’s all-time assists leader with 15,806. Career averages of 13.1 points, 10.5 assists, 2.2 steals, 51.5% field goals, 38.4% 3-point field goals. Nash’s style probably compares most favorably to Stockton’s. But even then, I don’t think the two are particularly close. One key point against Nash once again is the defensive side of the ball. Stockton’s athleticism wasn’t anything to write home about but he was still a very good defensive point guard. And if it wasn’t for Michael Jordan standing in the way of he and Karl Malone, Stockton would likely have at least one championship. Oscar Robertson: 12-time NBA All-Star, 1963-64 NBA MVP, 1970-71 NBA Champion. Career averages of 25.7 points, 7.5 rebounds, 9.5 assists, 48.5% field goals. The “Big O” actually averaged a triple-double during the 1961-62 season and came extremely close FOUR more times. Something I personally don’t think we’ll ever see again. Walt “Clyde” Frazier: 7-time NBA All-Star, first team All-NBA defense 7 times, 2-time NBA Champion. Career averages of 18.9 points, 5.9 rebounds, 6.1 assists, 49% field goals. Clyde had just as much skill as some of the game’s greats but was the ultimate team player. Though when he needed to take over, he did. In game seven of the 1970 NBA Finals against the Lakers, Frazier dropped 36 points and 19 assists to help lead the Knicks to their first NBA Championship. Isiah Thomas: 12-time NBA All-Star, 2-time NBA Champion, 1990 NBA Finals MVP. Career averages of 19.2 points, 9.3 assists, 1.9 steals, 45.2% field goals. If you combined Allen Iverson’s toughness and Chris Paul’s offensive skills+ability to run an offense, you MIGHT be able to create what Isiah Thomas was in his prime. One of the true fearless “little guys,” Zeke didn’t give a damn who you were, he was going to attack and find a way to beat you. The worst part is that most kids now just know Isiah the GM/Coach and view his basketball acumen in that light. But one of the greatest point guards of all time deserves a heck of a lot more notoriety than that. Bob Cousy: 13-time NBA All-Star, 6-time NBA Champion, 1956-57 NBA MVP. Career averages of 18.4 points, 5.2 rebounds, 7.5 assists. Known as the “Houdini of the Hardwood,” Cousy introduced a blend of ball-handling and passing skills that the league really hadn’t seen yet. Regarded as the first great point guard the league has seen, Cousy led the NBA in assists for eight consecutive seasons and really revolutionized the position and the sport. Jason Kidd: 10-time NBA All-Star, first team All-NBA defense 4 times, 2011 NBA Champion. Career averages of 12.6 points, 6.3 rebounds, 8.7 assists, 1.9 steals. 12,091 career assists ranks second all-time and 2,684 career steals also ranks second all-time. If not for Kidd’s last few seasons, he’d be over nine assists per game himself. A triple-double machine in his day (107 over his career), Kidd completely dominated games. He would control the pace and flow of the games and you’d check his stat line and only see three points on the night. One of the rare players that didn’t have to score but yet have such a huge impact. After being traded from Phoenix to New Jersey for Stephon Marbury, both teams went in complete opposite directions. The Suns were winning 50 games with Kidd and the Nets were the league’s laughing stock. A 26-win uptick in year one and the first of two NBA Finals appearances, Kidd’s impact was felt immediately in New Jersey. His role on the 2011 Dallas Mavericks championship team is not to be overlooked as well. Even his role on the 2012-13 New York Knicks was vital. His assistance to Carmelo Anthony’s career season and a 54-win season for the Knicks was significant. Perhaps the strangest of Kidd’s accomplishments were his career rankings in three-point field goals made. He was widely known as someone who couldn’t shoot. And for much of his career, he couldn’t. But by the time he retired, Kidd’s 1,988 trips made were good for third all-time. Gary Payton: 9-time NBA All-Star, 1995-96 NBA Defensive Player of the Year, 2006 NBA Champion. Career averages of 16.3 points, 3.9 rebounds, 6.7 assists, 1.8 steals, 46.6% field goals. Known as “The Glove,” Gary Payton was one of the greatest defensive point guards in the history of the league. Although he did play a contributing role on the 2006 Miami Heat championship team, the last four seasons of Payton’s career really delivered a blow on his overall numbers. From 1993-2003, GP averaged 20.8 points, 4.5 rebound, 7.9 assists, 2.1 steals en-route to a Hall of Fame career. He was one of the many victims at the hand of Michael Jordan. Payton’s Seattle Supersonics lost to Jordan’s Bulls in six games during the 1996 NBA Finals. The 72-10 Bulls, that is. That year Payton’s Sonics won 64 games and yet had eight less wins than their opponent in the NBA Finals. Think about how insane that number is. There are a few other players like Jerry West and Allen Iverson who are listed as both point guard and shooting guard but are probably much closer to the ladder, otherwise that would be two more clearly ahead of Nash. Then you have players like Nate “Tiny” Archibald, Tim Hardaway and Kevin Johnson that deserves some consideration ahead of Steve Nash. And then some of the players in today’s game. If Chris Paul’s team ever decides to stop underachieving in the playoffs and actually make some noise for once he can be on this list. If players like Stephen Curry and Russell Westbrook continue on the path their headed towards they’ll make the top-10 with ease. I’m not trying to rain on Steve Nash’s parade. The guy will be inducted into the Hall of Fame about five years from now. This wasn’t a blog telling you how horrible the guy is. I just don’t understand the dying need to catapult a player’s legacy to heights it never deserved to reach just because we all like him. Nash had an excellent career. He just wasn’t an all-time great and there’s nothing wrong with that. Not everyone can be. Statistical information provided by basketball-reference.com.